The EchoStar 5000 is the top-of-the-line DISH Network receiver and features a 32-bit microprocessor for quick channel and EPG response. 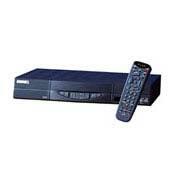 The unit includes two A/V outputs, one S-Video output and two additional inputs. It has a 10-event timer and a universal remote that can control up to four components. I am looking for the remote for that echostar srd 5000. Can´t fine them nowere. Can you help?